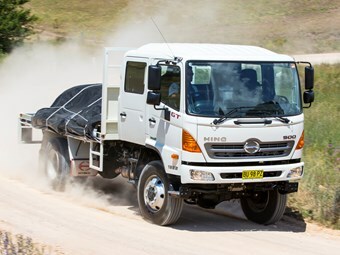 The first mid-sized 4WD Hino crew cab trucks with a fully automatic transmission have landed in Australia. The 500 series GT 1322 chassis have been bought by the Tasmanian Fire Service and are currently having bodies attached to them on the Apple Isle. For the first time they are custom-built with the Allison 2500 series transmission. The Tasmanians are so keen on automatics that for some time Hino has been pulling out manual gearboxes and retro-fitting Allisons for them. Hino is responding to the sort of customer demand which has also seen the competing Isuzu FTS 800 crew cab model offer the Allison gearbox option. Hino product planning manager Daniel Petrovski says 4WD automatics are a natural choice for rural fire services, making the job "so much easier" compared with a manual. "There’s no need to worry about what gear you’re in, or gear changes, or tackling the hills off-road," Petrovski says. "It’s just eyes on the road, concentrate on the job you’re doing." To that he could add that fire brigade officers who are also driving – as is often the case – can more safely use a fire radio handpiece in their left hand without also having to juggle changing gears. Petrovksi says there is a price premium for the auto transmission, "but you get a return on your investment very quickly in terms of the added safety that this vehicle will bring. "You can’t beat the automatic off-road for hill climbing ability," he adds. "This vehicle will go where a manual will struggle just due to the torque converter being able to deliver the torque smoothly to the tyres without wheel spin. "So it allows you to get up those steep, knarly hills a lot easier". The auto is also unlikely to stall on a very steep hill, but if it does, there is no need for the potentially dangerous stall recovery procedure required in manuals. The downside of automatics in crawler gear is that greater use of the brakes is required when descending.